This is a linux command line reference for common operations (HTML format). Hi! Thanks for linking to my Screen cheat sheet! 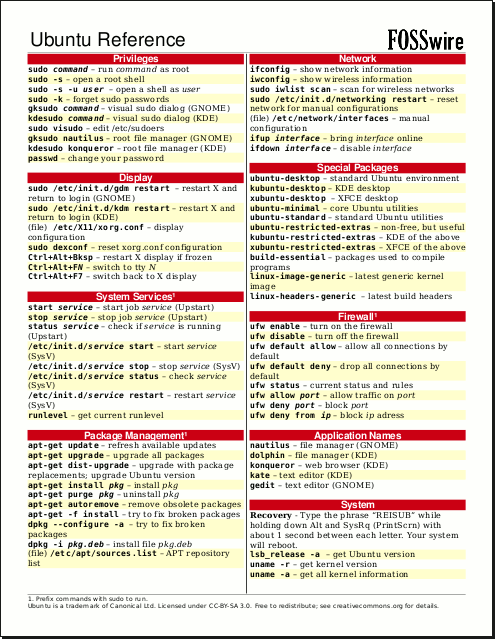 I’d like to let you know that I have 8 other Linux related cheat sheets! Please see the Cheat Sheets section on my blog! I have Awk, Ed, Sed, Perl and Bash cheat sheets there! Definitely nice collection!!! Really nice! Keep it up! Thank you. I’m very glad to see that you, and other people really like my posts. That’s why I will not stop. Thanks again Zico! Awesome…bookmarked and will checkout your other blogs! Thanks. I hope you’ll like them too. Pingback: Interesting Links « kyantonius.com - daily babblings! with translations to many languages! article, of course, good, but something it lacks. Pingback: $> eat BionicApple » Blog Archive » Just Some Text. That is Blue. Another good cheat sheet can be found here: http://linuxtutorial.todolistme.net/cheatsheet.php It’s good as you can hide sections you’re familiar with so you only see the valuable stuff. Also has links to a tutorial so if you need any more information on any section it’s right there for you.